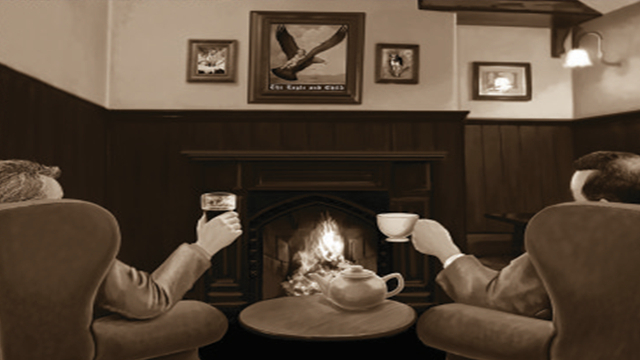 Of Wardrobe and Rings is set in the comfortable setting of Oxford’s Eagle and Child pub where the two old friends J R R Tolkien and CS Lewis meet and reminisce over their longstanding friendship. The production ambles along in a relaxed manner evoking the feeling of a warm fireside chat, which essentially is the whole premise of the show. The reunion covers both of the notable author’s career successes and also examines some of the underlying matters that led to periods of estrangement throughout this enduring friendship. The respective writers air their grievances with each other in particular Tolkien’s dislike of the Narnia chronicles including The Lion, the Witch and the Wardrobe and their differing opinions on Christian doctrine. Eventually though these issues melt into the background as the strength of their friendship and affection for each other wins though. Leading to a final reconciliation by the end of the performance. The show has a very gentle pace well suited to the scripted dialogue. However, the occasional fumbling of words from CS Lewis whilst partially can be attributed to the characters ill health, is none the less noticeable and stilts the ebb and flow of the performance. The blonde Barbie like nature of Hattie helps inject some exuberance into the performance. Though at times this felt slightly overdone and unconvincing detracting from the performance. Nevertheless, the concluding scene between CS Lewis and J R R Tolkien conveys with heartfelt emotion the unspoken realisation that this could be their final meeting in this life. Emphasising the strong and lasting friendship that existed between “Jack” and “Tollers”.